The fuss over Easyjet's 'Malaga not Margate' campaign is finally dying down after a frenzy of national news coverage. Having watched this week's somewhat excited BBC Southeast news coverage of the story, readers might be forgiven for imagining that the young Rodney had been reincarnated and returned to our seafront but perhaps that's my satirical imagination working late! Staying with the subject of imagination, we'll be needing a new mayor of Margate very soon and already there's speculation surrounding the possibility Will's replacement as he propels himself towards a Parliamentary career with the help of Party friends. This may involve Clive and company reinforcing the present Mayor and Mayoress partnership, by using their voting majority among the Charter Trustees, to place Jodie Hibbert into the role, with the present mayoral incumbent, Will Scobie reportedly being presented with a relatively safe Margate county council seat to fight in May. You will recall that the energetic Scobie, after only eleven months as a Councillor, was a controversial choice last year, as he was still at University and unless Labour, having now turned 200 years of tradition on its head, chooses to recycle some of the tired but familiar Councillor choices for the job, the options remain very limited. Call me old fashioned, which I am but as I've written before, I think a rapid progression from school to university and then to a safe and well-remunerated county political seat, without a job and a little life-experience somewhere in between, smacks of 18th century rotten boroughs, instead of the wider political debate we so desperately need in the 21st century. If Thanet's Conservatives acted so cynically, to accelerate the career of a son of one of their own at the taxpayer's expense, there would be howls of indignation and allegations of shameless 'nepotism' without any doubt. I did miss the Mayor of Margate prediction out from my 2013 crystal-ball gazing exercise, mainly because I believed there was a limit to even my political cynicism where the present, diversity inclusive local Labour group are involved but perhaps not. Putting it in print now puts them on the spot and we shall see what comes of it all in April and May. I'm sure that even you would admit that Will hasn't been quite the disaster you predicted. I agree with your comment that people need life skills etc but is there not a vague comparison in this to our prime minister ? He must have been helped up the ranks. In fact don't all political parties do this even to this day ? There are rumours of safe seats being groomed for sons of former MP's and cabinet ministers even now. That, I am afraid is the sad world we live in. It's not what you know it's who you know. I'm sure you are right 10:51 but just remind me where any Conservative went straight from school and university into a political post in recent times without a decent interval or some kind of job or career in between? Ahh so he had a job then and didn't magically parachute into a guaranteed political career straight from Eton? Makes you wonder if Socrates ever worked for a living before expounding that gem of Neo-Platonism, but really Simon the main criteria for political posts has to be intelligence and education. As one ladder into national politics is via local politics at what sort of age do you think one ought to start climbing it? Of course another ladder is Eton, Oxbridge, political advisor but you start on that one at the age of 13. Anyway assuming the Conservative Group were putting up one of their number as mayor, who would you recommend and what do you think the minimum age should be? You forget perhaps Michael, that Socrates, outside of being a prominent teacher of dialectic and a philosopher, gained considerable life experience as a citizen soldier in the Peloponnesian War. Intelligence, "Yes," "Education," with luck but frequently underrepresented at Westminster with one party invariably dominating the latter at least. The Conservative group really don't have an option given the balance and I certainly have no plans to put my name forward, now that Labour have politicised the role and undone the tradition in one stroke. But then I'm not 13 either. As usual, you are being obtuse, harking back to the original debate and so I must assume you approve that a direct run from 6th form to county counillor with no career or significant work experience in between is now acceptable in both local and national politics! In the case of Mr Cameron I have read that he was born in 1966. And lost his first election in 1997. So by my calculation he was 21 so was either still at Oxford or had just left. Yes then he became a political researcher, but does that really give you a full understanding of life in the real world ? It clearly shows if he had been successful at his first election he would have gone straight from Oxford in to parliament. He was defeated in his first candidacy for Parliament at Stafford in 1997, but was elected in 2001. 1997-1966 = 31 (not 21) You are ten year out. Cameron was also considered brilliant and was fast-tracked, which is possibly why he's the Prime Minister. Cameron studied Philosophy, Politics and Economics (PPE) at Oxford, gaining a first class honours degree. He then joined the Conservative Research Department and became Special Adviser to Norman Lamont, and then to Michael Howard. He was Director of Corporate Affairs at Carlton Communications for seven years. I can't honestly claim that he in any way reminds me of any of our local Labour councillors, educated or otherwise. Born in London, Miliband graduated from Corpus Christi College, Oxford and the London School of Economics, becoming first a television journalist and then a Labour Party researcher. In early 2005, Miliband, having passed on the opportunity to become a councillor in Thanet in favour of Mark Nottingham, resigned from the Treasury to stand for Parliament. What is this 200 years of tradition you are referring to ? Margate has been electing its Mayors since 1857. First as a Borough 1857 to 1973 then from 1974 to the present day by the Charter Trustees. I do not understand why you are so obsessive with Will and Jodie. But I do know one thing your words will come back one day and bite you back. I was waiting for this one.. I had a bet with myself and I won it that someone would be pedantic enough to quote 1857 at 5:10pm on a rainy afternoon etc rather than accept two centuries or two hundred years as an approximation! Not obsessive but Labour appear to be jumping through intellectual hoops in an effort to justify what the Will and Jodie show. You should note that it was recorded by the chair at the Westgate Residents Association meeting on Monday that Jodie did not turn-up 'again', sent no apologies as a ward councillor and has not responded to any emails invitations to make a councillor's report to the monthly meetings since the elections of May of last year. I'm seriously thinking of offering £5.00 for the first photograph of her seen in Westgate sent in by a member of the public. Does that answer your question as one of the ward councillors? OOps .. err yes 31 .. Maths never was my strong point ! Never the less, the point about people being groomed and sponsored for safe seats council or parliamnet is still a fair one. Departs blog trying to retain some dignity ! Even if Cllr Hibbert camped out across the road from you for a whole year with a giant sign saying 'I am Cllr Hibbert', you would still be making comments on your blog about never seeing her in Westgate. Not everyone needs to scream and shout about what they do, and it is also not compulsory for Cllrs to attend residents associations. Just ask Cllr Hornus or Cllr Tomlinson, but then you wouldn't make comments about them because they are Conservatives! Think you've touched a nerve there Simon. 11.37 Just a partial disaster then? Shame on you. I think it's lovely that a nice young man gets a nice job in the town with a nice salary thanks to his Daddy and his Daddy's friends voting for it. I wish my sons had such a kind Daddy with kind friends. Simon, Never mind Socrates, MP's and the PM. Where are you and your intelligent opposition colleagues when Hart Poole MsGonigal and Seed attend important meetings about the Royal Sands and come away with no minutes or records. 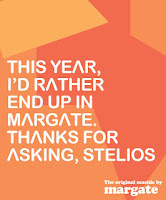 Where are you and your intelligent opposition colleagues when the Lessees of the Arlington site are in breach of their lease and causing demonstrable harm to Margate. Where are you and your intelligent opposition colleagues when Fenner uses your Council to promote the political agenda of the RSPCA by unloading animals at Ramsgate and herding them into a Council pen with an open drain so they fall in and have to be shot. Is Ian Driver the only Councillor to challenge these antics. Just the once 4:45 would be nice. The difference is that Iris, when she attends residents meetings, is constantly preaching how Jodie is working so hard in Westgate but always sends apologies on her behalf. I'm afraid people rumbled that some time ago! If someone can perhaps prove she exists as a ward councillor, walking her beat rather than canvassing for Will in Margate, perhaps a single report of a sighting around the town over the next six months, that may keep me quiet! Not sure about 5:01 other than Ian Driver makes a great deal of noise about pet issues but the Council is bigger than him and the challenges for the opposition extend beyond Royal Sands and the RSPCA to priority issues that impact on people's lives and services. How about her monthly surgery at the Westgate library? Perhaps you should drop in and see her if you are that obsessed by it. She has been there every month since shortly after being elected. At the Residents Association the conservative councillors who don't turn up were mentioned too and it was noted that only Tom King, Simon Moores and Robert Burgess turn up regularly or at least send apologies. Tried it for ages and frequently do the same with Roger Gale. I'm afraid being a councillor involves getting out and being seen not sitting alone in a surgery. As I said, Cllr Goodwin and I tried the Library and Unites Service Club (in his case) but it wasn't productive. Answering email is always a good start though and getting your face seen around the town and the shops is vital for word of mouth. Let's be honest.. it' s not just me. very few people know who she is and she has no footprint or presence in the town whatsoever and its past being a joke. Tell you what, here's a good idea. What about actually turning-up one evening to tell everyone what she has been doing locally, that Tom King or I haven't already done.? That's before the next election in three years. I'll be happy with that. How about next month? But we are getting distracted, which is exactly what my Labour friends want rather than look too closely at the the issue of mayor and even perhaps county council selection in under one term or 20 months as a councillor. Must be a local record of sorts and the justification appears to be giving some of our readers a real challenge! I live in Westgate so can you please tell me what dates and what times Cllr Hibbert will be at the library. Simon I know I am usually inclined to be – you kindly use the word obtuse – others would be less kind. However the situation with the county elections is something that I don’t really understand at all, so where are the safe Labour seats in Thanet? I know some time ago I brought up the issue of the viaduct that would form the access to The Royal Sands with one of my county councillors, Liz Green (Dave Green’s wife) and she told me that she was the only Labour county councillor in Thanet. This doesn’t suggest that there are really many safe Labour seats to be had. I guess as you seem to be saying that on the one hand the Labour group at Thanet council are not doing a good job at the moment and on the other that there is likely to be a considerable swing to Labour in Thanet, during the county elections, then there is something I don’t understand here. Or perhaps you are suggesting that Liz Green would stand down in Ramsgate, once again this doesn’t seem likely to me. Perhaps you could expand a bit on this business of safe Labour seats. To be honest my perception of the county council, is of an organisation that isn’t very good at doing its job or managing its purse very well, this may be effected by failed traffic management schemes, Kent TV, potholes and policing that makes me wary of venturing outside my front door of an evening. I'm sure the County Councillors can speak for themselves here. Given the high population churn rate in areas like Margate Central and Cliftonville West and the high benefits dependency in wards like these, it's quite likely that Labour will be peddling the same message I experienced here in Westgate last May. Namely, vote for us Mr or Mrs X and we'll work to recover the benefits, locally, that the nasty coalition have taken away from you. What's sad is that some people actually believed them...! Yeah lets keep talking about Dave to distract everyone from the Margate farce. I suppose the interesting thing is the intelligence of the electorate more than that of the candidates. This can be demonstrated by the stronger loyalty of grass roots Labour support than that of aimilar group of potential Tory voters. When Labour screw up, as they frequently do, they can still count on thir core voters and it is only the floating element they lose. When Conservatives screw up, as Cameron is tending to do, the more thinking Tory voters start looking round for somewhere to protest, currently UKIP. Add those to the floaters and you have a potential political disaster. The county elections will almost certainly tip Labour's way, but this will not be because they have done anything right. It will all be down to Cameron driving away, not just thinking Tory voters, but also the very people, the activists, who make winning elections possible. Will also works part time as a caseworker for an MEP, and so has lots of experience in politics. Will says, "This is an incredibly important election because Margate and Cliftonville residents need Labour Councillors to fight to protect them from the cuts being enforced by the Coalition Government. Alan makes a lot of sense, but there are other factors, namely the lack of effective conservative opposition in Thanet. Simon, we've heard nothing from your colleagues and even you are amazingly quiet on some issues that should be shouted from the rooftops. You are brilliant with local Westgate issues and your colleagues should be doing the same but unfortunately don't. Turning up on the doorstep once every four years just isn't good enough. Your colleagues should take a leaf out of your new found friend Cllr Driver's book, and be seen to be doing their job. How quaintly naive is Anon 2:33. Please, if you can, explain to me how some local Labour county councillors are going to be able to do anything about Coalition cuts. You may not have noticed, but it is not within the KCC brief being more about highways, policing and education. Even if they became MPs in a Labour government come 2015, they would still not be able to reverse the cuts because the country is broke and will be for a long time to come. Some realism would not go amiss in Labour quarters. The problem is finding councillors of any party who can use the technology available, write and avoid dropping themselves in hot water at the same time. In reply to Tom Clarke, I know that some people don't want to hear it but the next General Election battle here in Thanet seems to have already started and it looks as if Young ('cosmic') Scobie is going through a rapid box-ticking exercise towards being a candidate to challenge Roger Gale perhaps? And still no answer to my question asking for the dates and times Cllr Hibbert runs her surgery at the library.